Here's a list of the Gear the I endorse. These are private builders and they do amazing work! Check out their site and give them a call. Tell them TROY Sent You! If a private build is out of your price range or your looking for other gear I recommend. Here's a list of great gear that you can find on Amazon.com by clicking any of the pictures below. I play a Hudson 6 String Pedal Steel Guitar made by Jimmie Hudson. Click Here to visit his Website. Tell him Troy sent you! I play an Asher "Haumana" model 8 String Lap Steel. Made by Bill Asher. Here are links to some my favorite Dobro® Gear. 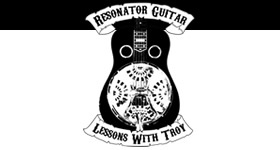 "Lessons With Troy" referred you! - I play a Duessenberg "Fairtale Lap Steel"
As a beginner or seasoned pro, you may be interested in the latest models of square-neck resophonic guitars from RedLine Resophonics, "The Econoline Rambler." These guitars are built very similar to our already popular "Rambler" series. We have simply simplified some of the more labor intensive operations, and we are passing the savings on to the player. These Econoline Ramblers are available in two body sizes, those being the traditional R-Body size, and the larger size, which we call "The Peabody." All of our guitars offer plenty of volume, regardless of the size, but the Peabody offers that extra amount of horse-power you might need in some jamming or on-stage situations. Consider it an insurance policy! Either way you go, you will be getting a great guitar. We feel that this series of guitar offers the best performance to price ratio available. You will be getting an American made guitar that is well built and sounds great! - This is my other website that has other teachers and other instrument video lessons on it. Same great format! I have some really great teachers working with me. There are lessons for all kinds of instruments! Guitar, Bass, Fiddle, Violin, Banjo, Mandolin, and even Trumpet!! The Gateway Ramblers - St. Louis Bluegrass Band - This is my Bluegrass Trio based out of St. Louis Missouri. Members are Will Miskall - Vocals/Bass, Ben Smith - Vocals/Guitar/Mandolin/Fiddle, Troy Brenningmeyer - Dobro/Vocals. - This is Tooter Meredith's website. He is one of the Best Resonator Guitar Luthiers in the World, and he is currently making me my "Dream Instrument". A Beautiful Mahogany Resonator Guitar with the Fishman Aura Bridge Pickup installed. I can't wait to get it in my hands!!! - This is an amazing computer program. Make sure you get the "Real Tracks"! It allows you to make most any backing track, change the key, instrumentation, tempos, and a ton more. - This is another amazing computer program that allows you to slow down and loop sections of music. CD, Mp3, etc -- Great stuff! This is the website I used to print my cool looking Dobro® T-Shirts! This is really a great company/website!! Check 'em out if you're looking for someplace to make T-Shirts or other merchandise for you! - This is one of the BEST Dobro® Forums on the planet!! - Another GREAT Dobro® Forum!! - Another GREAT Dobro® Resource!! - Brad's a super nice guy and has a really prolific site about all things "Steel"! - They make some really amazing Dobros®!! - One of the GREATS!!! - A wonderful German Dobro® Player!! He has a ton of really great Dobro® Videos on YouTube!! - A wonderful Chicago Dobro® Player!! Tons of great info on his site!! - Fantastic Dobro® player with the Biscuit Burners! One of the GREATS!! - One of the GREATS!! - One of the up-and-coming GREATS of the instrument! - An accomplished mulit-instrumentalist/session player. - With a unique style of tasteful melodies, relaxed bluegrass grooves, and coherent improvising on original songs, Ivan's music has appeared in over 150 TV shows and films. - An Alaskan Dobro® Player that plays a lot in EGBGBD Tuning, and comes up with some really nice arrangements with great chords!! - Another Great Dobro® Player from Germany! - Awesome Grammy Award Winning Dobro® Player!! - Awesome Dobro® Player from Ireland! - GREAT Dobro® Player and Instructor!! - GREAT Dobro® and Slide Player. She has some really nice DVDs out too!! - Really fantastic Dobro® Player from Norway! !